My first Yamaha C3 Scooter modifications addressed some basic comfort and styling issues that were nagging me. Sticking to the non-warranty voiding modifications that don’t allow me to personally crack open the engine, I’ve done a few more small mods that offer some utility, safety, and fun. If Danger Prone Kwanye bites it today at Dot Com Scooter Gang like the poor guy did at Dot Com Segway, we’ll be well prepared. Because of the cavernous storage compartment in my Yamaha C3 Scooter, I can fit a whole ton of things in here. 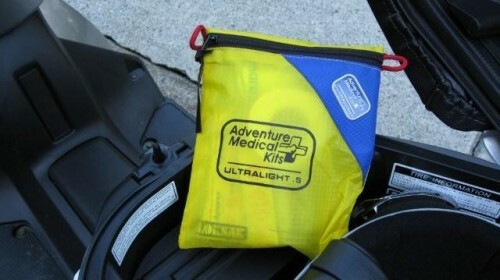 One of those things is this first aid kit that I picked up at MEC for $14.50. This kit gives you all the basics including rubber gloves so you can tend to your own wounds or the wounds of your wiped out comrades without catching cooties. The kit is small, flat, and waterproof so you don’t end up applying soggy bandages. Even if you don’t plan on spilling, you never know when someone else will. There is no better way to capture the action than with a video camera. 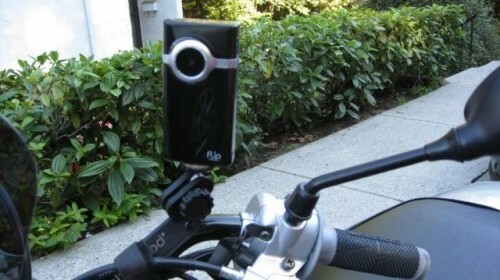 However, video cameras and digital cameras in general are expensive and running over them with a Segway or a Scooter isn’t a great way to take care of them. That’s why having a cheap and useful video camera in your reportoire like the Flip Mino is great for those times when you know (or don’t know) how much carnage may happen on a machine that is built to be crash proof. But how are you going to mount it so that someone can’t blame it for causing the Segway to crash? How about an UltraPod Mini! Unlike the poor Manfrotto ModoPocket Mini Tripod that got bent in the Great Segway Crash of 2008, the Ultrapod Mini tripod features a pivoting head and legs that are folded down the center at 90 degrees for stiffness. They fold apart like a fan when in use, and fold together when you need to store it. The best features of this tripod is the attached velcro strap that not only helps the Ultrapod stay together for storage, but also allows you to secure it to a pole, structure, or in this case, the handlebars of my Yamaha C3 Scooter. The mounting is very secure and you can tighten it quite snuggly with the velcro around the bars. Since the head mounts on a ball socket, I can pretty much move it wherever I want. It got this at MEC as well for $13.50. Not bad at all. I Need NOS! Two Bottles! How about one bottle and a straw? One of the things that many scooters lack is a place to put a beverage. This handy beverage holder, originally made for things like JetSkis and other watercraft , is perfect for the less choppy waters of a scooter. Using a pair of suction cups, this thing sticks to any flat clean surface on your scooter. I chose to mount it down low to keep the center of gravity intact, but you can mount it up higher if you wish. 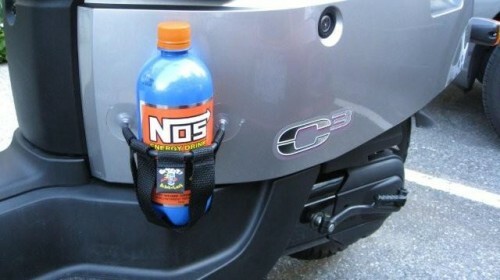 It’s excellent for mounting a bottle of NOS (or two if you buy a second one for the other side) to help you race for those pink slips…NOT! Stay tuned for the Dot Com Scooter Gang Video later today! Hopefully a camera survives to tell the tale. The First Ever Dot Com Scooter Gang!